We all want a nice flawless look when applying our cosmetics whether it be over the top or very subtle. To achieve any flawless look you always need a great base to start with. Gives dehydrated skin intense moisture. After washing my face every evening, I applied the Infusion. It's plasma like and really has no scent. For the first couple of days I really didn't notice any difference. I was starting to think this stuff doesn't work. I decided to continue to use for a while longer as my nightly routine. Surprisingly I did start noticing subtle results. My skin looked great when waking up in the morning. As you know often times your skin can look dry and drawn upon waking. It absorbs fairly quickly and isn't greasy. Although the jar is on the small side- the plus is that it lasts a while because you only need a small amount. Add depth, dimension and drama to your look with pressed, micronized minerals in a unique, 3-dimensional design! Multi-tasking Pür Rocks enhance and brighten eyes, lips and cheeks with a dose of luminous colour. Vibrant, organic jewel tones of garnet and pink zircon capture the splendor of a desert sunset, illuminating the face with shimmering, rosy undertones. The first day I applied it I did on bare face and it gave me a soft brightened look. I then tried it with two types of foundation- mousse and stick. Looks better with mousse. There can be a number of reasons why but it is what it is. I loved the rosey glow it gave me. Glow: The moisturizer after a little over a week started showing subtle results. It kept my skin hydrated overnight and the Pur Rocks gave me a rosey glow. Glare: The moisturizer contains Parabens. And I did notice two abrasions on my face. They didn't appear until after I started using the moisturizer and when I stopped they were gone. Now I don't know if I had irritation on my face prior to using the moisturizer. That was my experience. Overall Glam: Overall I like the products. The moisturizer, although it works, I'm being cautious if I continue use. If these "abrasions" show up again I will discontinue use and move on. The Pur Rocks is definitely a keeper-proved it can be wore alone or over makeup. Thanks for the comment Nikstar! 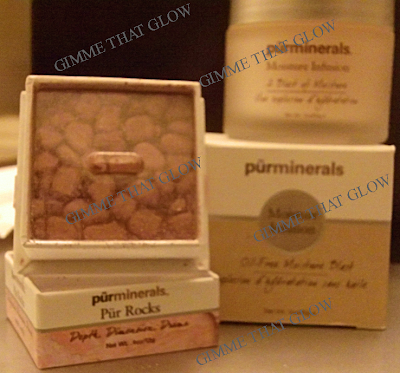 The Pur Rocks gives me such a great glow! I often wear it alone and it brightens up my face! It's worth giving it a try!